The existence of the bathroom is not only needed in the home, also in the location of the building and infrastructure development projects, public facilities, as well as remote areas. Prefabricated bathroom seems to be able to answer these needs. Besides being cheaper and can save construction costs, also minimal labor by 60 percent compared to conventional bathroom. But, what is prefabricated bathroom? Basically, prefabricated bathroom is not much different from prefabricated home or buildings. Prefabricated homes, or which also often called prefab home, assembled from parts that have been created or printed outside of the construction site. Likewise with the prefabricated bathrooms. 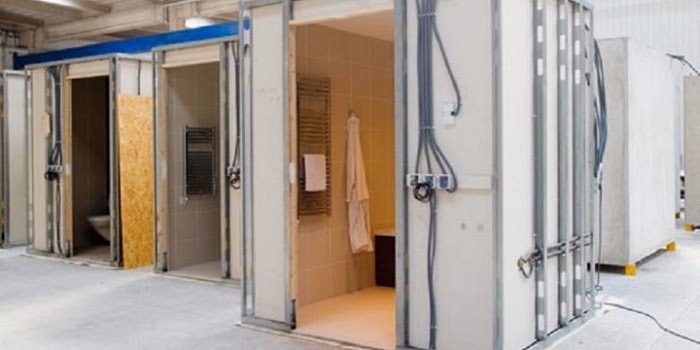 Building and Construction Authority (BCA) from Singapore has introduced prefabricated bathroom unit (PBU) about two-year. Each PBU is built using dry installation method. Basically, the PBU parts has been made ​​in the factory, and then assembled at the project site. Prefabricated Bathroom Unit claimed relatively superior when compared with a conventional bath rooms. Conventional bathroom construction requires a layer of bricks, plaster, waterproof coating, installation of taps and drains, electricity installation, painting, tiling, also windows, doors, and other devices. Meanwhile, Prefabricated Bathroom Unit is much more time efficient because it does not require the installation of brick and various other devices. The construction of each prefabricated bathroom only takes half a day. Its construction does not require special skilled workers. In fact, every unit is guaranteed to have passed the quality control at the factory, and are made from various materials that can be selected by the homeowner. Related posts with "Prefabricated Bathroom Unit Advantages"
Prefabricated bathroom save construction costs and up to 60 percent of construction worker compared to conventional bathroom.